Find out what disposable colored contact lenses are available and where to buy them online. Do you want to change your eye color using contact lenses but you need the convenience of a disposable lens too? Well the good news is you can now buy disposable colored contact lenses, making it easy to change the color of your eyes whenever you want. This page talks about the most popular types of disposable soft contacts available to either enhance or completely change your own eye shade. Celebrities have encouraged the growth of cosmetic colored contacts as stars like Lady Gaga and Paris Hilton use them like fashion accessories, changing their eye color according to what outfit they decide to put on in the morning. Until a few years ago, colored lenses were only available as soft lenses, intended for annual replacement. NB: When you add a layer of color to a contact lens, it becomes thicker and a colored soft lens intended to last for 12 months can be very uncomfortable to wear for many people. But technological advances in lens materials have resulted in much thinner lenses intended for 1 or 2 week disposable use and these are now also available as cosmetic colored lenses. That makes it easy for people to use colored contacts for fashion purposes as disposable soft lenses are relataively easy to get used to. You don't need be short or long-sighted to wear them as they are also available in plano (zero power) form. NB: Please note however that you still need a prescription from a qualified optician before you can order discount colored contact lenses online. Acuvue 2 Colours Enhancers are a 1 to 2 week wear disposable soft lens suitable for people with light colored eyes, available in shades of blue through to green. the sister lens to the one above are meant for people with dark or light eyes and come in 7 different shades from blue to brown. 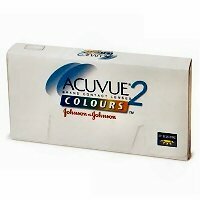 Acuvue Colours are super comfortable as the ultra thin lens allows plenty of oxygen through to the eye during wear. These lenses are recommended for first-time wearers. Freshlook Colorblends come in 12 different shades and are a bi-monthly disposable lens, although your eye care practioner may prescribe a different replacement schedule. They are wider in diameter than Acuvue 2 Colours so they do not suit everyone, but they are very popular because of the wide range of colors available. 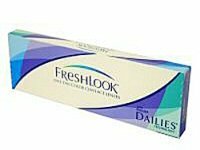 Freshlook ONE-DAY is the first daily disposable colored contact lens available on the market and is the best way to try colored lenses as they only cost $14.95 for a box of 10 lenses. Daily disposable contact lenses are much thinner than 2 week or monthly disposables, so if you've never worn lenses before as you just want them for fashion purposes, they be a better option. These lenses have a diameter similar to the Acuvue colors.